The journey to this table, beautifully set in an East Village apartment, was on the surface, a typical gathering of New Yorkers passionate about food, yet once the conversation began and motivations for being there were shared, it was clearly, not typical in any way. Conceived as a fundraising dinner for the Sylvia Center, it was an intimate dinner for 12 hosted by artist Mimi Oka and her husband. As the evening progressed from congregating in the kitchen (naturally) around the most delicious hors d'oeuvres to gathering around the table for Peter Hoffman's exquisite fall dinner, we shared our stories. These stories are really life stories that find food at the crossroads of decision-making choices about direction, career and personal focus. Our hostess migrated from the world of finance to art, discovering that food was an integral part of her medium. Best described as a "sustenance artist", she and her artistic partner think about art not as a static piece on a wall, but as an experience that changes the viewer. (It is in that context, that it is multi-dimensional and revolutionary. People participate in the process of creation and the art is often consumed. Thus, the art truly becomes a part of the viewer.) Mimi's love for art, food and children translated to her offering her home for the evening. With full bellies, we went around the table. A couple, drawn to the dinner because they are conscious foodies and young parents, first crossed paths with Anna Hammond (Executive Director of Sylvia Center) at a program "What's on your Plate" and then upstate near Katchkie Farm. Another guest, a new board member, described his current romance with food, coffee in particular (graduating from roasting coffee beans in his apartment to opening a coffee business in Williamsburg - Brooklyn Roasting Company.) Michael found the way to us via his Katchkie Farm CSA share and his daughter volunteered at the Sylvia Center. Again, a love of and respect for food, translated itself into compassion for children without access to bountiful, healthy food choices. And so on around the table - our appreciation of food as a way of celebrating nature and community - is enriched when it is shared. The disparity between the food rich and the food poor diminishes our ability to feel comfortable at the table without doing something to help change the status quo. The scene enacted that evening - a gathering of people to talk, share experiences, learn, exchange ideas - and fueled by creative delicious food - illustrates how so much in life happens around food....around the table....in the kitchen, where we are most relaxed and secure. But the real highlight of the evening was the insights shared by Chef Instructor Hollie Greene as she described her work with the children over the past several months. Hollie got her Masters Degree in Human Resource Development and spent several years at Amex in HR "to be able to do good things for people." A product of a household where the family sat together nightly for dinner, and a lazy susan dominated the table, she discovered that she was even more passionate about food and cooking. 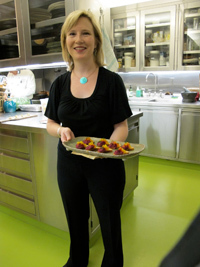 A vacation at a cooking school in Tuscany, where the instructor focused on teaching about healthy-delicious cuisine, left her thinking about helping children through cooking. Upon her return to the US, she applied to the French Culinary Institute. It took some time, but finally this year, after months of blending a corporate career with volunteer work at Sylvia Center and Wellness in the Schools, she made the leap to "living my dream" and working teaching children full time. "Food is a neutral place to get together and talk about the day - like I did with my mom," Hollie shared. The thrill of introducing kids in the programs to new foods and tastes is clear when she describes the interactions in the kitchen. "We tried 3 different kinds of squash and cooked the seeds. I just invited them to share their thoughts about the different tastes." A typical experiment might be something like bringing her pasta machine from home and making handmade pasta with the kids. Then, they also cook up some dried store bought pasta and talk about the taste differences. The kids like both. "It's okay" as it is the engagement in conversation and exploration that really matters. They compare the flavors and preferences for veggies raw and then cooked. "I listen to the kids - its not about how I like it - they need to develop their taste buds. They can tell when food is ready." It is the peer-to-peer conversations that are telling - "Why are you so finicky? We all like this!" She recalls a group of insecure camp counselors this summer who were afraid of the fresh food that was going to be served for lunch - "the kids won't like it." But Hollie knew they would - and she was right. She knew that once they picked the veggies, cleaned and cooked them, they would enjoy the fruits of their labor. And why not - the ingredients were fresh and filled with great flavor. Ask her about the corn salad that she made with her group at Rutgers/NYCHA program and she gets so excited. It was a simple recipe - corn cut off the cobb, sautéed in olive oil, with red and green peppers, a little bit of red onion, lime juice and touch of cumin. The kids vetoed the tomatoes, opting to serve them sliced with mozzarella and fresh basil. "The kids and adults went nuts for the corn salad. Everyone wanted to know what was in it." It was a perfect grand finale to a wonderful summer that inspired not only the children (several now cook regularly with their parents at home) but also the community (several ladies in the community center regularly ask questions about cooking). Hollie ended our evening dinner on a high note. I have watched her around the kitchen worktable with groups of children, as her warmth and humor infuse each task with respect for the food, the process and the child. It is not hard to envision her as a little girl back in rural South Carolina making mud pies "so good, you could eat them."